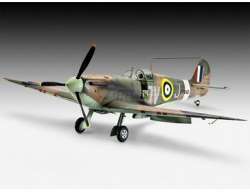 Newly tooled kit from Revell of the Supermarine Spitfire Mk.IIa. Textured surfaces with finely engraved panel joints. Detailed Mk.IIa wings with MG openings. Detailed cockpit and instrument panel. Supermarine Mk.IIa, No. 19 Squadron, Royal Air Force, Fowlmere, England, June 1941. Supermarine Spitfire Mk.IIa, No. 65 Squadron, Royal Air Force, Kirton-in-Lindsey, England, Juli 1941.